Japanese beermaker Kirin says it has been cleared by a court to buy a majority stake in family-run Brazilian brewer Schincariol. Kirin will spend $2.6bn (£1.7bn) on buying 50.45% of the beer and soft-drink maker, after an injunction halting the deal was overturned. Minority shareholders had said they should have been offered the stake. 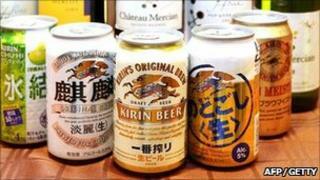 "Our way is clear for the PMI [post-merger integration]," a Kirin spokeswoman said. Minority shareholders had claimed the 50.45% stake sale violated their right to be given first offer on the shares that Kirin is buying from brothers Alexandre and Adriano Schincariol. Schincariol is Brazil's second-largest beer producer, owning brands such as Nova Schin and Devassa Bem Loura. It reported sales of about $1.8bn in 2010. Kirin is looking for growth overseas as Japan's beer market shrinks, forcing the nation's brewers to look abroad - with a strong yen helping fund acquisitions. Kirin also owns Australia's Lion Nathan and has a 48% stake in San Miguel Brewery of the Philippines. Brazil's beer market is dominated by AmBev, the conglomerate formed when Belgium's Interbrew merged with Anheuser-Busch to become the world's biggest brewer.